This guidebook describes 18 day walks and 6 long distance routes. The treks include a 5-day traverse of the French Mercantour National Park and a 7-day traverse of the Alpi Maritime Park, and the walks range from 6 to 20km in length. The routes are suitable for novices and experienced trekkers alike. 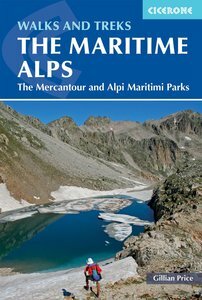 Guidebook to walking and trekking in the Maritime Alps on the border of Italy and France, just north of Nice. It includes 18 graded day walks, on both the French and the Italian sides, ranging from 6km to 20km in length and suitable for a range of abilities. There are also 6 long treks, including a 5-day traverse of the Parc National du Mercantour and a 7-day traverse of the Parco Naturale delle Alpi Marittime. Detailed route descriptions sit alongside colour maps, and there is full information about accommodation options down in the valleys and up in the mountains. Useful French-English and Italian-English glossaries of walking terminology are included, too. Rising to over 3000m above the sun-drenched French Riviera, the Maritime Alps form the western edge of the mighty Alpine chain. Wildflower lovers will also appreciate the remarkable range of flowers, including many unique to the area. Worlds away from the hustle and bustle and crowds of the coast this is a marvellous area for novice walkers and seasoned long-distance trekkers alike.